The World War II German Air Force was called the Luftwaffe. While it was responsible for all the civilian deaths in Hatfield due to enemy action, not all of its visits resulted in violence. General Erhard Milch – German Secretary of State for Air and second only to the head of the Luftwaffe Reichmarschall Herman Goering. Colonel Karl Bodenschatz – ADC (aide-de-camp) to Herman Goering (dating back to their days together in the WWI Richthoffen wing). He later rose to the rank of Major General and was one of those wounded in a failed bomb attempt on Hitler. General Ralph Wenninger – then German Air Attache in London. He has an unusual background for an air force officer – having served in WWI as a u-boat commander (and sank 97 merchant vessels). Major Hans Seidemann – winner of the 1937 London-Isle of Man Air Race. Attempted to defend his title in the 1938 London-Isle of Man Air, which started from Hatfield, but only managed to come seventh. He went on to serve in Spain, Western Europe, Africa and Russia, and commanded large formations like the Fliegerfuhrer Afrika and Fliegerkorps VIII. He finished the war with the rank of Generalleutnant. Junkers 88A-1, 3Z+BB of Stab I/KG77, Wk no. 4136 – piloted by Oberleutenant Siegward Fiebig – bombed the de Havilland factory on 3 October 1940 (causing the town's greatest loss of life during the war). It was shot down by the airfield defences – the only German aircraft to crash on the British Isles that day (others crashed into the sea or in Continental Europe). The V1 Flying Bomb programme was run by the Luftwaffe (until taken over by the SS in the closing stages of the war). The two V1 strikes on the town that caused civilian fatalities (on 22 September and 10 October 1944) were different from the majority of attacks in that they were almost certainly air-launched missiles (the V1 ramps in France were being overrun and ceased firing on 1 September 1944). Messerschmitt Bf109E-4 fighter (Wk. no. 4101 – currently on display in The Battle of Britain Hall at the RAF Museum, London) – paid Hatfield a visit on 8 February 1942 – without any incident as it was flown by a British pilot at the time. 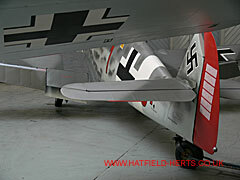 Other German aircraft known to have landed at Hatfield during WWII include a Ju88 and Fw190 – all belonging to the RAF 1426 Enemy Aircraft Flight dubbed the Rafwaffe.